Beat cream cheese and sugar with electric mixer until well blended. Fold in whipped topping, green food coloring and peppermint extract. Pour into chocolate crust. Refrigerate 3 hours or overnight. Top with crumbles chocolate cookies and chocolate syrup. Cut into slices and serve. Store in refrigerator. Grasshopper Pie is one of those desserts that terrified me as a kid. My brothers had convinced me that the reason Grasshopper Pie is the color green is because it had smashed up grasshoppers in it. You can only imagine the fun they had torturing me with candy gummy worms. In some cultures, however, sugared grasshoppers are actually served as dessert. While, that’s not a delicacy I plan on indulging in anytime soon, the chocolate and mint flavor combination has always been a favorite of mine. Now that I am older and wiser, I can enjoy a Grasshopper Pie with a carefree mind. This Grasshopper Mint Pie starts off with a chocolate crust filled with a creamy (grasshopper free) mint filling. The pie is chilled then topped with crumbled chocolate cookies and drizzled with chocolate syrup. This Grasshopper Mint Pie only takes about 5 minutes to prepare and a couple of hours of chilling until it is ready to serve. If you are lucky enough to find mint chocolate sandwich cookies like I did, it sends this pie into chocolate/mint overload (which isn’t a bad thing). 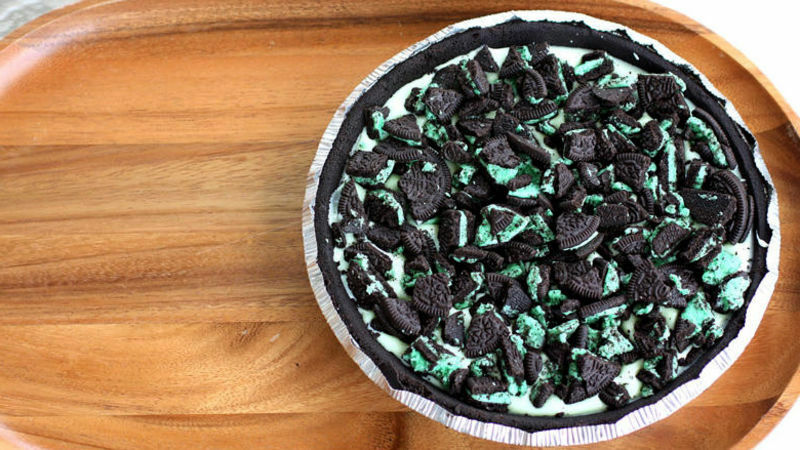 I hate to rub in in…but here in Florida it’s so hot that my Grasshopper Mint Pie started melting on me! Here's the full recipe so you can enjoy Grasshopper Mint Pie at your house!